A prophet and a poet deliver an Easter message for 2018.
or any emotion in between. Traditionally, the story of Jonah begins with the prophet trying to escape his divine mission to warn the people of Ninevah of impending destruction. Perversely, Jonah boards a ship going in the opposite direction. Sailors on board try to avert the disaster, which Jonah’s disobedience has apparently brought on: they toss him into the sea. 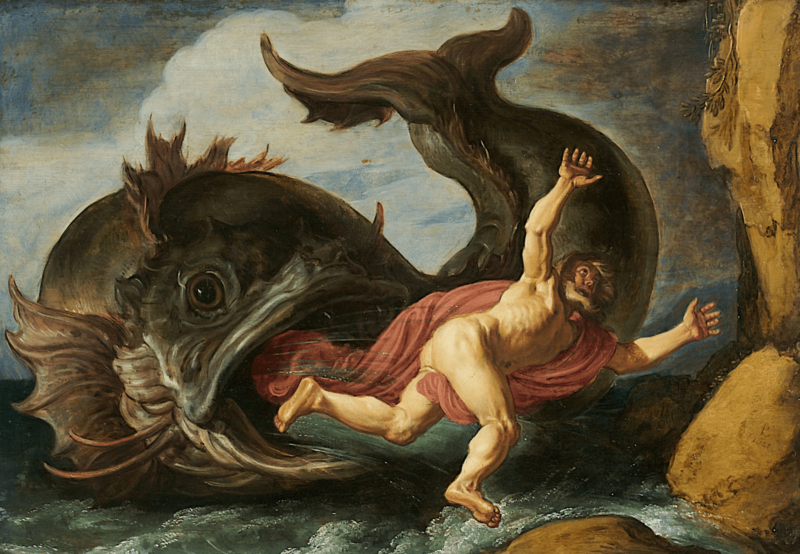 Miraculously, God saves Jonah by having him swallowed by a large fish, in whose belly he spends three days and three nights, which some say is a metaphor for Christ’s death, burial, and resurrection. Even though a merciful God spared Ninevah from catastrophe, Jonah became angry because the Ninevites did not receive the judgment he thought they deserved. When the gourd died, Jonah becomes depressed, noted in the Old Testament book of Jonah. I often felt blue when my children were younger and my husband and I were beginning our careers. Hormones could have also played a role in my emotional roller-coaster rides. I thought then that a kick to our household finances and help from a maid service would fix my mood. Fortunately, I have never had to be hospitalized for the “down” feeling, but I sympathize with those who do. There is no shame in admitting the problem or seeking help. Nowadays when I fall into a negative mood, I galvanize myself into action and go into a housecleaning or cooking spree – or take a long walk. Doing for others is also a good tonic. However, sometimes it is healthy to “ride” the mood and let myself feel sad for a while and not anesthetize myself with drugs. Some researchers have speculated that one reason for the current opioid epidemic is that those addicted do not wish to feel pain of any kind, either physical or psychic. Depression is a temporal condition, but belief in the resurrection can provide eternal hope. 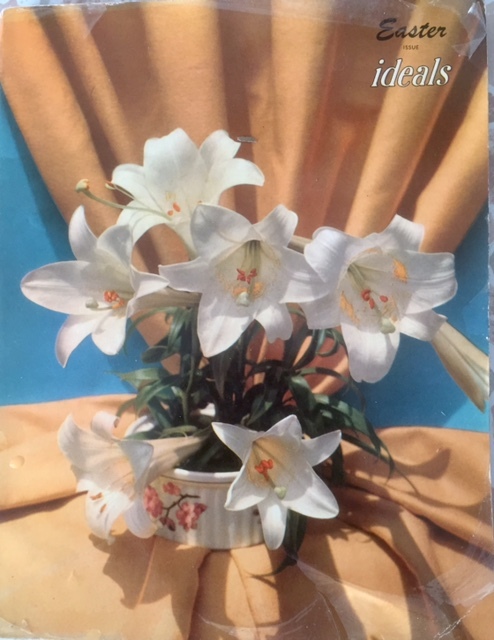 Both Easter and the Passover deliver messages of hope and deliverance, here symbolized by lilies on the cover of a vintage Ideals magazine from 1955, Ruth M. Longenecker archives. Happy Easter . . . Passover Peace! Can you relate in any way to Jonah? 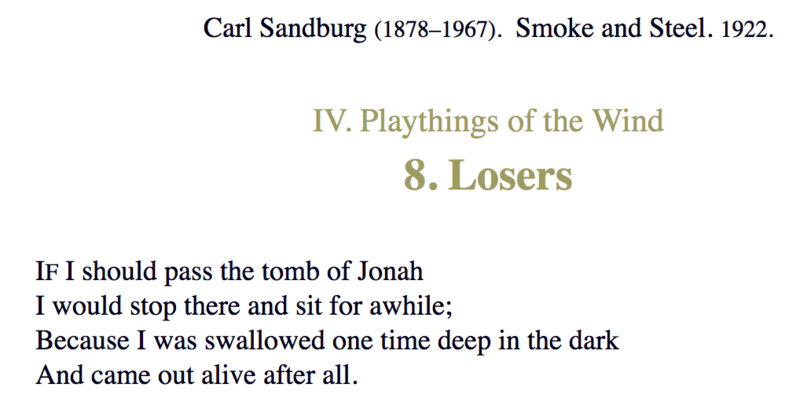 To Carl Sandburg? What tips do can you share to get out of the clutches of sadness or feelings of depression? Jill, I definitely understand the toll taking care of parents takes on one’s emotions. You are doing a good work, though, and honoring mom and dad through your toil. I like the phrase “reset my mind,” a helpful maxim to follow when we get stuck in the muck. Thanks ~ and Happy Easter to you too! Good morning, Marian! When I’m feeling down (which, of course, is totally different from people who are truly clinically depressed), it helps to go to the gym and do an intense workout. Otherwise, getting lost in a novel or movie is something I’ve also done, especially when the girls were little. From FB, it looks like you’re preparing for Easter. Happy Easter to you and your family! You are wise enough to know that the low feeling is telling us it’s time to re-charge, and it’s best to embrace it. And, yes, it may take a day or two, especially if we’ve been pushing hard to finish a project. This too shall pass! ~ my maxim too. “Spring comes to Vermont” may be a good blog title, or at least a Facebook post very soon. Thanks, Janet! Your post is timely. I’ve lain awake much of the night as, inexplicably, waves of sadness washed over me. I go to prayer first and that’s where I’ve been. A busy day ahead, and a little girl’s laughter, will likely be the remedy for the near term. Still, something needs attention. A wonderful, timely message. When I taught the Jonah story in my Sunday school class earlier this year, our takeaway from the lesson was, “We’re all in this together.” That’s a good Easter message too. I agree the people these days seem to think that there is never supposed to be a feeling of anxiousness or sadness. They seem to think that everyone other than them exists in a permanent state of bliss. I hope that time, conversation and caring helps people to realize that sadness and anxious feelings are something everyone feels, but we’re all in this together, so we can enjoy the grief and walk through it. Arlene, I can’t think of a better takeaway than “We’re all in this together.” It’s part of the human condition to feel a wide range of emotions from happy to sad, especially if something we did (like Jonah) contributed to the cause. I once read that comparison with others is a real downer. For when we look at others from the outside we see their strengths and compare those to our weaknesses, a sure set-up for despair. Thanks, Arlene, for your encouraging comment! I’ve known depression a handful of times in my life, and each time I became a more empathic person. The story of the resurrection meant even more to me after that. Like Sandburg, since I have lived to tell the story, I am awed by the power of light to overcome darkness. I remember this power in dark times, such as now. Thank you for mentioning the benefit of empathy and also noting that light complements the dark ~ can even overcome it. Just one little candle can begin the recovery. I too feel a pall over our nation. We hope for honorable leadership, and when that doesn’t happen it’s easy to fall into despair. But like you, I will focus on the message of Psalm 42:5 Happy Easter to you and your extended family, Shirley! Marian, I have had bouts of depression. Just the other day, I had one. So I can relate to this post. Prayer and laughter helped. I wound up talking to a friend who prayed with me. We also had a good laugh, which helped tremendously. Oh, Marie, how wonderful to have an empathetic friend. Thanks for mentioning laughter; no one else has broughth it up as a good antidote for feeling down. Laughter is a great antidote because it brings you back into the moment, away from stray thoughts. Thanks so much for the encouragement! This is a lovely and timely post that rings true with me. I like Bible stories for what they can tell me about living life now. I agree that many people avoid feeling pain of any kind– either with drugs/alcohol OR social media/video distractions. When I feel depressed, I just let it happen, knowing that it’s a feeling worth accepting for what it is. I figure if I have joy in my life, then occasionally I’ll have sadness. Balance is key. Balance is key. Yes, Ally, on the see-saw of life we are apt to lose balance, and when that happens it’s a good idea to “just let it happen” because in time sadness will pass. I go through those sad periods, I have learned to honor the feelings, let them be. Feelings are neither right nor wrong. They just are. Sister Joyce Rupp talks about praying our way through the losses in her book, PRAYING OUR GOODBYES. Then I am able to move forward in faith. Lovely post that serves as a reminder of the power of faith and hope during the Easter season, my favorite. Happy Easter to you and your extended family, Kathy! Thank you, Marian. Happy Easter to you and yours, too! I hope you can get Sister Rupp’s book. It’s very consoling. Marian, your Ideals magazine cover brought back a lot of memories. I used to look at them as a teenager when I was babysitting at my pastor’s house, and it was always a treat. I have kept a few of the magazines I acquired, and there was one that my grandchildren used to look at when they were little. For some reason they loved the pictures in that one. My youngest daughter deals with depression during her cycle and there are always a few days in the month when she struggles.Just walking through this with her has given me an understanding and empathy that I didn’t have before. She is quite open about it and I have been amazed at how many people share with her about their own battle with depression. When we grew up, Elfrieda, keeping our dark feelings to ourselves was the thing to do. How wonderful that your daughter’s showing her vulnerability has opened doors of ministry to her. Happy Easter to you and Hardy! I think we all have times of sadness and depression. I was a little depressed after moving to Spain and missing my family. We got a dog and that fixed that! The snuggles, the walks, someone to look, after all made a difference. The sun helps too! I feel for those with chronic depression though as that must be difficult to deal with. Moving to Spain must have been a huge culture shock and involved a separation from your Canadian family. You were brave to attempt it! I’m glad a dog helped soothe your emotions. I see him sometimes on your blog posts and on Facebook. When my sister-in-law moved from the west coast to Florida temporarily, she found a little Shih Tzu was just the ticket. Easter blessings to you and yours, Darlene! Marian — I very much appreciate this hope-filled post. Thank you. When sorrow, grief, or despair visit me, I sit with them quietly until I’ve learned what it is they’ve come to teach me. Sometimes it takes a while (I can be slow on the uptake). However, once I’ve grasped the lesson, I invite gratitude in to take their place. You make a great point about gratitude,Laurie. Sadness and gratitude cannot co-exist, at least not for long. I am feeling with you gratitude for the box filled with advance reader copies of your new book. Wowza! Thanks Marian for this post and the bible story about Jonah … magnificent photo of Lastman’s. 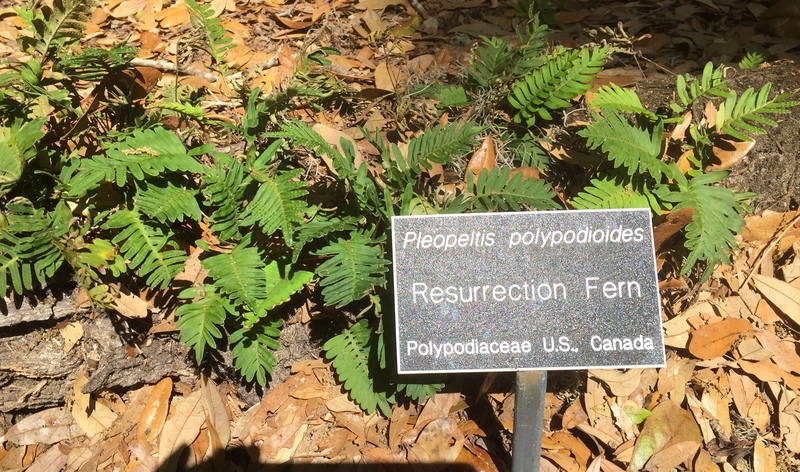 Loved the lilies and the Resurrection fern park pictures too. I remember a Jungian analyst once saying ‘depression is a gift from the gods’. I took this to mean that when we do feel de-pressed, it can be a way to get into or be pressed into the depths. There are times that I feel seriously low and question the meaning of life and get into an existential angst. I sort of take my pulse and let those low periods their time. My husband who is a medical specialist was saying the other day that when he takes a history of patients he is very surprised at the very high percentage who are on anti-depressants. Thank you for adding some detail about depression from both a Jungian and medical perspective. When I went for my annual physical this year, the doc presented me with a list of questions, many about feelings of depression. When I queried him, he said that many of his patients report that they get upset “about every little thing.” I get the impression doctors deal with many medical problems rooted in emotional disturbance. You made a valuable statement about dealing with sadness, which I hope others will read: “I sort of take my pulse and let those low periods their time.” I know I need to allow myself some time off from working on my manuscript, just to read for fun and hang loose. You must remember having such feelings when you and Susan were writing your book. Yes? Happy Easter to you and your extended family, Susan! I often feel low in the darkness of the winter months (SAD) and there were times when I just didn’t seem to find the strength to get out of bed. I used to put it down to the awful British weather and this is another reason why we have taken a year sabbatical and spent winter in the Mediterranean. The light is so beautiful and bright there that I didn’t feel low once! Like you, I refuse to take any kind of antidepressants. You and Peter are smart to winter in the Mediterranean. That takes boldness and initiative to plan. Florida is usually bright except in December and January, but I remember the light in Italy being more luminous somehow, especially in Tuscany. I wonder if you have been there. Yes, I don’t need to be drugged. I need all of my brain cells to function. Ha! You have touched on a subject close to my heart . I was ill for many years with depression after having my son …it consumed me much like the dementors in Harry Potter . I , like you Marian , thankfully, have never been hospitalised . What always worked for me was the library , I read loads of wonderful books and still do , writing poetry, just get all the emotion out and walking out in nature really lifts the spirits . What having depression does is make the sufferer and kinder person , I think you learn to be compassionate to others and their misfortune, so I am not suprised that you have bouts of depression because you have such a kind nature . I’m glad this post touched a chord with you. I wonder if you were suffering from post-partum depression after giving birth. I remember after our daughter was born I told my husband, “I can’t take care of her any more.” Fortunately for both of us the feeling (caused by a hormone imbalance probably) did pass after a few weeks. Like you, another reader (Shirley, above) made a comment about depression helping one to feel empathetic and compassionate toward others. You have that quality too. The art of Jonah was amazing–don’t know if I’ve ever seen it but when glancing at it briefly at the office, quickly moved on because of the flesh visible on my screen!! My heart reaches out to those dealing with long term depression–not easy to deal with, though it has been friends and relatives who’ve struggled in this way. Our research interviewing people for the Shadow Voices documentary was just eye opening and heart breaking. I will be posting a resurrection story for tomorrow–my computer at home died so we’ll see how it goes! Perhaps Costco will have the resurrect my online life at home! A blessed Easter to your whole family. I look forward to the Shadow Voices documentary which sounds intriguing. More details? I do know that many people wear a brave face, hiding their sorrows and conflicted feelings even now. I remember ignoring counseling when I was a sophomore at EMC after a break-up. “Conceal your feelings and don’t admit need” was the way Mennonite mantra then. Best wishes on resurrecting your online life. It’s so disturbing not to have computer access at home. A blessed Easter to you and your extended family too, Melodie! It aired on ABC-TV and NBC at the time–several times over several years; we had many many phone calls in response to the documentary. Thanks for asking. It shows a more vulnerable side of Sandburg, doesn’t it? You probably know he was Swedish-American in origin, a fact I wasn’t aware of when I read his poetry in school. Thanks for acknowledging the truth of these four lines, Fiona! Most people can probably relate to this feeling. I totally sympathize with depressed people, as I often think “What has this world come to?” Experiencing so many situations where, because people are ignorant, selfish or don’t know how to do their job, this affects our lives negatively, makes me sour. Witnessing how people don’t care about the environment, which affects us all, is another example that puts me down. But… when it is just me, I can handle it. I get through it, I go for a walk, focus on work, read. When it is my husband, depressed by factors around him and his work situation, I’m at a loss. Especially since this affects everything we do and has been going on for a long time. I go absolutely nuts about recycling stuff, and I hate all the packaging that fills our bin every week. I get it. Those of us in the “caring species” (love that!) have sensitivities others may lack, but I’d rather be of that ilk than the opposite. Yes, there is always hope! 🙂 We sure do. Always. Now that doesn’t work with every low period I experience, but it falls in line with your expression of embracing the depressive nature to experience whatever gift might be waiting inside it. Thanks for the hopeful message at this Easter season, and a special thanks for a trip down memory lane with the magazine cover! Blessings to you and Cliff! Just minutes ago, Cliff and I were discussing the aches and pains of getting older. He vacuumed the bedroom (which hurts my back too much!) and after I thanked him I remarked, “Someone has said if you feel bad, concentrate on the part that doesn’t feel bad, even if it’s only 10%. Yes, as Marian has said, focusing on the positive more than the negative. Even in this tumultuous life at times, we all have much to be thankful for, especially for a Hope during this Easter season. Hope in tumultous times. Yes, a comfort! Thanks for sharing your story about how you dealt with depression! I can relate; I spent most of my life believing it was normal to think about suicide at least once a day. I just assumed it was part of the human condition. Fortunately, a change of diet (eliminating gluten and dairy) worked wonders for me, and I haven’t thought about killing myself once since I made that change. I feel like I came out of the belly of a whale, too, and I hope a lot of people will have a similar experience. Spring, with its promise of renewal and rebirth, is definitely the right metaphor! Oh, Rebecca, my heart goes out to you: Suffering so long without a remedy. Who knew that body chemistry played such a role in your suicidal feelings, and that a change of diet would fix the problem. Wow! Thank you, Marian. Does anyone escapes periods of depression? I know how to ride the waves with more grace than I did as a grieving teenager, but it took years of psychological work and practice. Thank you for giving these confusing dark feelings a wider and deeper perspective with Jonah’s story. For me, depression is often linked with unexpressed anger or feeling cornered with no way out. Elaine, I locked on to your insightful words: “I know how to ride the waves with more grace” now. I can certainly say Amen to that. When I was much younger I would disappear into a funk for 2-3 days, often over circumstances, especially the financial squeeze. Now I recognize the symptoms and take action before they hijack my feelings for days on end. Yes, psychologists would agree that depression and anger may be two sides of the same coin, existing in sort of a yin and yang relationship. I lived with a father who I think suffered in its throes. I’m glad this post spoke. Thanks for adding your on take on the topic.